My Web Shield is the PUP that uses misleading techniques to prevent removal. Use Reimage to locate malicious components and get rid of them faster than with uninstall instructions. A full system scan blocks virus reappearance and prevents traffic to malicious domains. 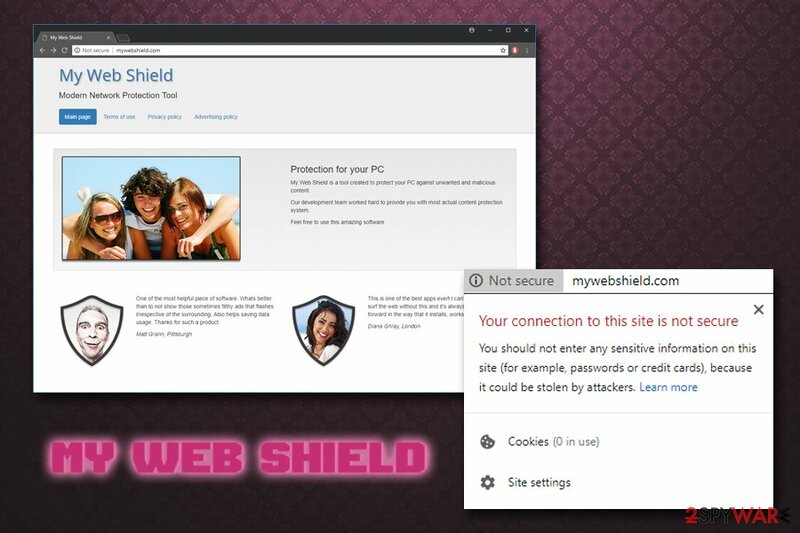 My Web Shield is a questionable application that is usually promoted via advertisements or is injected into users' computers via software bundling. Regardless of the installation technique, the app promises users to prevent them from visiting malicious websites, which could lure netizens to keep the program. Unfortunately, My Web Shield installation also has certain side effects. Users will soon notice annoying pop-ups, deals, offers, in-text links and various other forms of advertising popping on Google Chrome, Internet Explorer, Mozilla Firefox and other browsers, regardless of which website is visited. Compatible browsers Google Chrome, Internet Explorer, Mozilla Firefox, Safari, Opera, etc. The application is considered to be adware, and, while not malicious by its design (it does not corrupt or damage system files in any way), might cause users a lot of frustration. While they struggle to understand where the program came from, My Web Shield removal might be a problem as well, as adware is known to obfuscate its presence well – it usually does not provide the executable to uninstall the app, as well as hides under different names. Pop-ups, auto-play video, and audio ads can appear on any website that is visited, regardless if it promotes sponsored content or not. 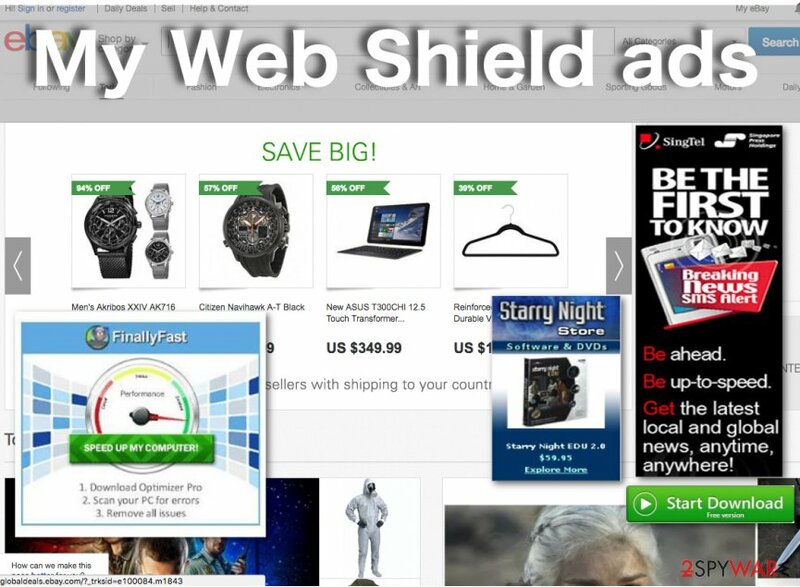 Therefore, finding the correct information plagued by My Web Shield ads might become an impossible task. The purpose of such information tracking is to generate targeted ads. Thus, every time you visit a website which represents your favorite football team, the adware carefully records that and sends you an advertisement related to it. However, My Web Shield ads might be coming from phishing, fake or overpriced sites that would make you waste money on useless stuff. There is no doubt that online security is necessary, but users should rely on legitimate tools to protect them online. If the PUP entered your machine without your knowledge, security experts recommend using Reimage to remove My Web Shield ads from your computer. The scan will also eliminate all other dubious applications that could have gotten in while adware was present on your system. PUP developers use various tactics to get this nasty program on the users’ computers, but the most common one is called bundling. This marketing strategy is also acknowledged by beginning software creators who use it to spread the word about their product to make it popular. 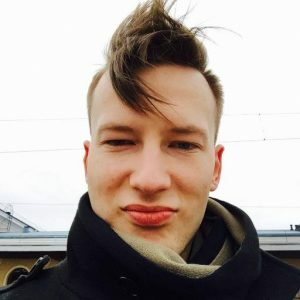 The sad news is that the well-known developers like Microsoft are using the same technique. While the installed programs might not be malicious, they can certainly cause users some trouble. Therefore, we recommend you being extremely careful when downloading and installing new software from the internet, regardless of how acclaimed it is. You should never rush through installation steps and read Terms and Conditions properly. Most importantly, opt for Advanced/Custom installation instructions instead of Quick/Recommended ones. This will allow you to eliminate all the tick marks next to add-ons, browser extensions, optimization tools and other useless software before the installation is complete. Finally, we urge you to stay away from suspicious ads and redirects. Adware can also be installed when browsing the internet, as adverts on certain websites might convince you of the legitimacy of certain apps. Do not fall for this trick, and research the app on Google.com, Bing.com, Yahoo.com or another reputable search engine. My Web Shield virus is a program that should not linger on your computer. Since it usually stays on the victims’ computers for quite some time, it is deep-rooted in the system, and its related components may be spread throughout the computer without any particular order making manual My Web Shield removal quite complicated. Thus, it is useful to have professional antivirus software that could remove My Web Shield ads automatically. All you have to do is download one of the programs mentioned below and run a full system scan. We should also inform you that there is other, alternative way to banish potentially unwanted programs from your PC – manual elimination. If you would like to try out this method, scroll down below where you will find detailed instructions. Here, look for My Web Shield or any other recently installed suspicious programs. Wait until you see Applications folder and look for My Web Shield or any other suspicious programs on it. Now right click on every of such entries and select Move to Trash. When in the new window, check Delete personal settings and select Reset again to complete My Web Shield removal. Once these steps are finished, My Web Shield should be removed from your Microsoft Edge browser. Here, select My Web Shield and other questionable plugins. Click Remove to delete these entries. Now you will see Reset Firefox to its default state message with Reset Firefox button. Click this button for several times and complete My Web Shield removal. Here, select My Web Shield and other malicious plugins and select trash icon to delete these entries. Click Reset to confirm this action and complete My Web Shield removal. Here, select Extensions and look for My Web Shield or other suspicious entries. Click on the Uninstall button to get rid each of them. Now you will see a detailed dialog window filled with reset options. All of those options are usually checked, but you can specify which of them you want to reset. Click the Reset button to complete My Web Shield removal process. ^ Adware. Trend Micro. Malware researchers. ^ Everything You Need to Know about Tracking Cookies (Computer cookies). SaferVPN. Safety Blog. ^ Senzavirus. Senzavirus. Cybersecurity news and articles. This entry was posted on 2018-08-14 at 07:50 and is filed under Adware, Viruses. You can quickly scan the QR code with your mobile device and have My Web Shield ads manual removal instructions right in your pocket. How did you remove My Web Shield ads?